Chubby Cherub © 1986 Bandai. North American release. Game developed in Japan. 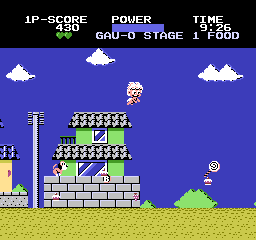 See the original Famicom version for more information: "Obake no Q Tarou - Wan Wan Panic". A game where you'll chomp and chase all day! Chubby Cherub is a chivalrous little angel whose life is far from trouble-free. He gets bitten by dogs and pecked at by birds. Firecrackers are thrown at him and smoke puffs cover him from head to toe. And all because he wants to help people - and get some food to eat! Your skills can get Chubby Cherub out of trouble. In this fun-filled, fast-paced Game Pak, you and Chubby Cherub can go on endless adventures. And with you at the controls, Chubby Cherub can rescue his friend, perform his deeds, and make the day a cheerful one! Released in October 1986 in the USA.